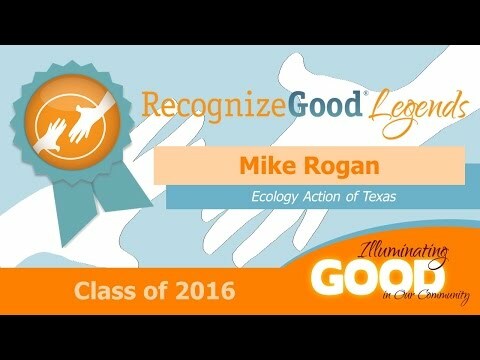 Pitching in more than 1,500 volunteer hours – and counting – Mike Rogan helped Ecology Action of Texas transform a closed municipal landfill into a robust nature preserve. Some volunteers just don’t know how to stop giving. Mike Rogan, longtime volunteer for Ecology Action of Texas, a recycling and environmental education center, is just such a case. When Ecology Action first began formulating a plan to rehabilitate Circle Acres, a former landfill and “brownfield” in Austin’s Montopolis neighborhood, Mike came on board through Travis Audubon to identify the dozens of different bird and other wildlife species on the site. As Mike walked the site each day, he quickly began to drive the development of the entire project – before long he had blazed and designed every walking trail on the site, made detailed improvements to the project’s infrastructure, and identified over 150 species of wildlife. When flash floods created erosion issues on the property, Mike actually built a check dam to redirect creek flow all on his own – literally moving boulders, singlehandedly! Today, Circle Acres is one of Ecology Action’s biggest successes, home to a 3-acre wetland tract supporting a robust urban forest and bird population. The site is set to open to the public later this year. It’s no surprise that Mike Rogan remains a vital part of the operations, never missing a volunteer event and serving as a volunteer manager leading teams to build trails, work on litter abatement and remove invasive species.